Shipping Prices will be displayed in the Cart. The Amounts here are a guide to approximately how much it will cost to ship your order. For All Orders. Payment must be received in FULL for your order before we will ship it out. No Exceptions. USPS Priority Mail Packages are automatically insured against damage or loss for the first $50 of your Order. You must choose the option with Insurance if you wish to have your package insured against loss or damage for more than this amount. Our Shopping Cart Shipping System has been updated to reflect this change resulting in LOWER shipping rates for small orders that need to be insured. We HIGHLY recommend that you INSURE your larger Priority packages when shipped. We WILL NOT replace your package if it is missing contents, damaged, or lost if you do not purchase enough insurance. For most orders this is around $2 extra per order. USPS Express mail comes automatically with $100 of insurance. If you did not purchase extra insurance for your orders over $50 (Priority) or $100 (Express), and they are damaged/lost in transit, we will NOT replace/refund more than the insured amount. No exceptions. If you DID purchase extra insurance, or you have only a small order that was damaged/lost and something happened to your package, you will need to retain everything you received (packaging, receipts, notes from the post office, etc) to file a claim. Claims must be made within 20 days of shipment and will be processed through the USPS and/or Stamps.com insurance claims departments. Once a valid claim is made, we will replace any missing or damaged products in your order. You may be required to return any damaged products, or torn envelopes for claims purposes. We apologize for any inconvenience, but it isn't our rule, it's the insurance companies. If you wish to have a refund instead, a refund to your payment method will be made after we have received the insurance claim money. This total process could take up to 60 days, although we see most claims processed within 30 days. We apologize that it may take this long, but it takes up to 30 days for the insurance company to process claims and up to another 30 for us to actually receive the refund, plus however long it took you to actually contact us to make the claim. We will stay in contact with you throughout the process to ensure that everything goes smoothly for everyone. WHEN DOES YOUR ORDER GET SHIPPED? Orders received by 2pm Pacific time (5pm Eastern), will usually be shipped that Business day. If something you order is out of stock, we will email/call you to let you know of any delays. All orders after that Time will be shipped on the following Business day. Orders Placed after 2pm on Friday will be Shipped the Following Monday. We try to get orders placed by 2pm shipped out by 4pm that day during the week, however it is not a guaranteed unless we tell you it is. If you entered a valid email address during checkout you should receive an email update with the tracking info on your package. Shipments are subject to delays by Holidays and Weekends. We will be Closed MLK, Jr Day, Presidents Day, Easter, Memorial Day, Independence Day, Labor Day, Thanksgiving, the day after Thanksgiving, Christmas Eve, Christmas Day, New Years Eve, and New Years Day. Please do not expect to receive orders on these days either as they are usually Postal Holidays as well. The US Postal System does not deliver on Postal Holidays, so please take this into account when placing your order. For ALL packages, The day your order is SHIPPED, does NOT count as a shipping day, as all orders are taken to the Post Office in the Afternoon. All orders are on hold until Credit Card is approved the day we ship your order. We do NOT ship on Saturday's or Sunday's. *Some Packages are heavier than others, and may cost more to ship. We have tried to make the shopping cart calculate these extra costs, however we will either call you or send you an e-mail if additional shipping is necessary. We have NEVER needed to do this, however we reserve the right to do so. ALL USPS Priority Mail Packages DO have Tracking. We will make every attempt to locate your package and can put traces on lost packages after 5 business days (weekends dont count), however it is your responsibility if you do not add insurance to your order. see Insurance above for details. All USPS Express Orders have tracking and automatically come with $100 of Insurance. Ximo Orders are shipped via USPS or UPS depending on the Order, and have Tracking included. If you entered a valid email address during checkout you should receive an email from us when your order is shipped. 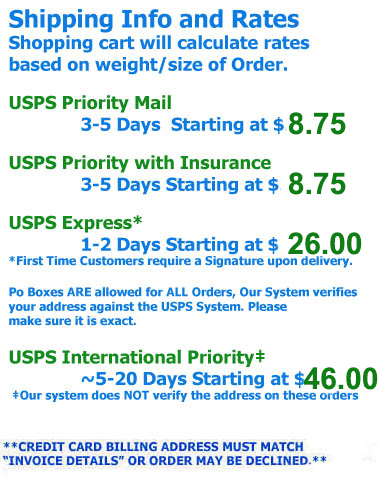 If You have not received your Order within 7 days, PLEASE E-MAIL US for the Tracking Number associated with your Order if you do not have it, or if you would like our help in locating your package. Delivery Times and Days may vary depending on your location. Pickup Schedule: We ship out Daily Monday-Friday all orders generally received by 2pm Pacific Time. We reserve the right to alter this shipping time frame based on our need, including extending it until later. We will post notices if we have any temporary changes. (see our Facebook for this info) Any order AFTER 2pm Pacific time will not be shipped until the following Business Day. Rural Deliveries: Please make a note that if you know you are rural, you will receive your order, but it may take an extra couple of days. Some areas are more rural and Express shipping is really 3-5 day shipping. If you know you are rural, please allow for these delays. Also, there is NO delivery Guarantee by USPS for deliveries to these areas. Please be aware that in some extremely Rural Areas Delivery Drivers may deliver only ONCE PER WEEK, so PLEASE BE SURE to leave a visible note asking the driver to leave your package if you know you are rural. Most rural areas have a 2 day delivery by 5pm for Express Orders, however that is NOT guaranteed. USPS only Delivers Monday through Saturday for Priority and Express Orders. USPS is no longer guaranteeing weekend deliveries without an additional Fee. If your package is scheduled to be delivered on a Saturday, the Post Office may deliver your package, but it is not guaranteed without an additional fee. If you are not available at the time delivery is attempted for your package, we cannot guarantee a time for redelivery. Re-delivery is normally the next normal business delivery day for your area. - If it is questionable whether someone will be home to sign for your package, please WAIVE THE SIGNATURE. All NEW Customers shipping via Express Mail REQUIRE a signature REGARDLESS of whether you want to waive it. This is for your protection, as well as ours. For USPS Express Orders, Weekend deliveries will usually be attempted on Saturday Only and then again on the Next Normal Business Day. If your Order is being Shipped to a Business or Other location where someone may not be at until a specific time, Please NOTE this when placing your Order..
Ximo orders placed through our distributor page may take up to 7 days to ship out. If your order is not showing as "shipped" with a tracking number after 7 business days, please call or email us, so we can make sure it is shipped. It's not being shipped by us, but we will do our best to help you get your order in a timely fashion. If you specify an APO address (military) in your ship to address, it will be mailed through the US Post Office Priority Mail with Insurance ONLY. If you select ANY other method for shipping we will send you an e-mail to alert you to any additional charges/credits that may apply to your order. FOR APO ORDERS: Any customs, taxes, import duties, or any other applicable charges are your responsibility and are collected once the package reaches the country where your order is being sent. We have no jurisdiction over these expenses and cannot determine what they may be. Customs polices vary widely from country to country; please contact your local customs office for further information. We cannot be responsible for orders that may be seized by Customs in your Country. Contact your local customs office to make sure there are no restrictions on Vitamins and Health Supplements prior to placing your order. Outside the USA: You cannot add Insurance to your package. We apologize for any inconvenience. Any orders being shipped outside the United States (excluding APO's) will be shipped at your own risk. Orders placed without tracking are at your own risk. If you we cannot track your package we will not be able to find it if it doesn't arrive in a timely manner. We cannot be responsible for lost, damaged, or refused items. You will be responsible for all customs fees and taxes associated with getting your order. Our Shopping cart is set up to process the approximate shipping fees outside of the USA. Any Order placed may be revised to include accurate shipping costs if shipping to your country turns out to be more than the amount shown on the shopping cart. If you are concerned about the cost, please email us first, and We will be able to accurately tell you beforehand what the cost will be. Customs duties and taxes are your responsibility, and unless otherwise noted on your order, the pricing for the products will be listed as the regular prices on any customs forms we need to fill out to ship your order. Please do not ask us to do anything that may be questionable. If you wish to cancel an order, you MUST contact us before 2pm Pacific the day it is scheduled to Ship. Orders placed after 2pm Pacific on Friday have until Monday at 2pm Pacific to Contact us to Cancel them. We process and ship orders between 12 and 3pm Pacific Monday-Friday. If you place your order within this time frame, and wish to cancel you will need to CALL us immediately. Orders placed as late as 3pm Pacific can still be shipped out THAT day. Keep in mind that once you place an order we have a VERY limited amount of time available to cancel your order. ALL PACKAGES leave our warehouse/office by 3pm Pacific Monday-Friday, unless otherwise noted. We offer an exchange, replacement, or refund on New Sealed Unopened Product within the First 15 Days of Purchase. We must receive product within 15 days of Original Purchase for a valid exchange or refund. As ALL orders have tracking or delivery confirmation, we will be able to know exactly when you received your order, and will calculate the 15 days from THAT day. You MUST contact us prior to returning product for an RMA#, or your return will be DENIED. Refusing a Package at delivery does NOT mean you didn't accept it in the first place, and you must STILL contact us to let us know that you have refused Delivery. We are NOT responsible for the return shipping, and any damage that may happen to your package in the process. It is your responsibility to make sure it is returned in resalable condition. Shipping & Insurance Charges are non-refundable and cannot be applied toward exchange, refund or replacement credit. If you have a problem with the quality of your product (i.e. thick bottle, etc. ), please notify us within 30 days of purchase so that we can exchange/replace/refund your product. You will be required to send back any faulty product before we can replace it to you. Returned bottles must be mostly full unless otherwise authorized. We will not accept returns with empty bottles for any reason. If after examining returned product for "quality" problems it is determined there is no problem with the quality, we reserve the right to deny your return. You will be notified if this happens. You Must contact us prior to returning the products for an RMA Authorization. Failure to contact us will result in your return being refused and denied. All Returns are subject to a 15% restocking fee.